Check when your local NPR radio station is airing Mountain Stage to hear Tall Heights! “Spirit Cold” by Tall Heights is the sweeping soundtrack to this viral wedding video, as featured on Cosmopolitan and HelloGiggles. 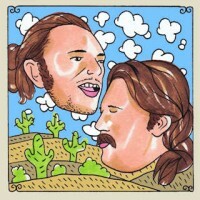 Check out the new Daytrotter session from Tall Heights! Recorded in Rock Island, IL, the session features live recordings of new songs, two of which you can hear on their EP Holding On, Holding Out.